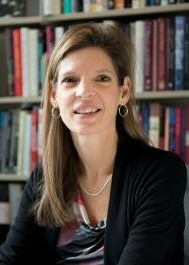 Professor McKellar studies the history of medicine and disease, with a special interest in the history of medical technology, instruments and devices, the history of surgery, and medical biography. Professor McKellar teaches the history of medicine, the medical profession, and related historical aspects of 'doctoring' to medical students in the Schulich School of Medicine and Dentistry as well as teaches the history of disease and society, including public health initiatives, epidemic outbreaks and social response to undergraduate and graduate history students in the Faculty of Social Science. 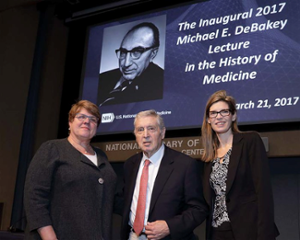 She advises a number of graduate students, and welcomes inquiries from MA and PhD students interested in the history of medicine and disease. Professor McKellar is currently working on two book projects. (1) In collaboration with Dr David Kenny, DDS 1970, who was a member of the first graduating class of the Western dental program, McKellar is documenting the history of the dental school program at Western University. (2) McKellar is in the early stages of a new project, “Cutting as Cure: Objects and Stories in the History of Surgery,” which is an object-centred study exploring how instruments and the act of cutting have shaped our approach to disease. 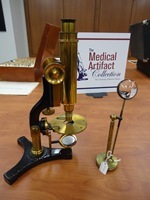 Professor McKellar also curates the Medical Artifact Collection, which is a university study collection, representative of late 19th- and early to mid-20th century practice and teaching of health and medicine in southwestern Ontario. It can be viewed online at www.medicalhistory.uwo.ca. Artificial Hearts: The Allure and Ambivalence of a Controversial Medical Technology (Johns Hopkins University Press, 2018). 384 pp. 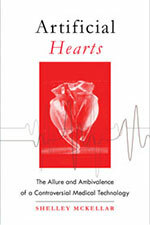 This book explores the controversial history of the development and clinical use of artificial hearts, from the 1950s to the present day, offering a fascinating case study of an imperfect technology that speaks to questions of expectations, limitations and uncertainty in a high-technology medical world. JHU Press guest blog "Dissecting Artificial Hearts" available here. CBC London Morning interview on Artificial Hearts available here. 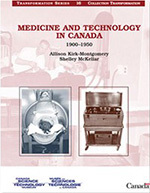 Medicine and Technology in Canada, 1900-1950 . with Allison Kirk-Montgomery. Transformation Series #16 (Ottawa: Canada Science and Technology Museum, 2008). 171 pp. This volume examines the various technological developments in Canadian medicine from 1900 to 1950, highlighting larger patterns in medicine, identifying Canadian contributions, and considering the impact of these innovations on Canadian society. 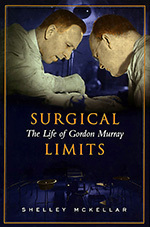 Surgical Limits: The Life of Gordon Murray (University of Toronto Press, 2003). 270 pp. This biography chronicles the life of one of Canada's most prominent and controversial surgeons, Gordon Murray (1894-1976), discussing Murray’s surgical ingenuity and skill, and how he saved numerous lives through his advances in heart and vascular surgery, his experimental cancer treatment, and his development of a kidney dialysis machine while also engaging in larger issues relating to the limits of surgery, the modern medical research endeavour, and the rising power and authority of the surgeon. 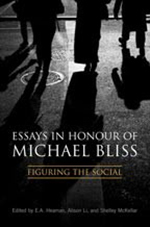 Essays in Honour of Michael Bliss: Figuring the Social. Co-edited with Alison Li, Elsbeth Heaman. (Toronto: University of Toronto Press, 2008). 491 pp. A collection of essays, predominantly written by former doctoral students of Canadian historian Michael Bliss, discuss his career, his impact on the study of history, and the writing of social and medical history in Canada in the late twentieth century. “Disruptive Potential: The ‘Landmark’ REMATCH Trial, Left Ventricular Assist Device (LVAD) Technology and the Surgical Treatment of Heart Failure in the United States”, Technological Change in Modern Surgery: Historical Perspectives on Innovation edited by Thomas Schlich and Christopher Crenner (Rochester, NY: University of Rochester Press, 2017), 129-155. "Medicine and Technology in the United States", The Oxford Encyclopedia of the History of American Science, Medicine, and Technology, edited by Hugh R. Slotten (Oxford University Press, 2014): 73-8. “Limitations Exposed: Willem J. Kolff and his Contentious Pursuit of a Mechanical Heart”, in Essays in Honour of Michael Bliss: Figuring the Social , co-edited by Alison Li, Elsbeth Heaman, and Shelley McKellar (University of Toronto Press, 2008): 400-434. “Cardiac conditions”, Encyclopedia of Disability edited by Gary L. Albrecht (Sage Press, 2006), pp.219-221. “Hearts, artificial”, Encyclopedia of Twentieth-Century Technology , edited by Colin A. Hempstead and William E. Worthington (New York: Routledge Press, 2005). 2 vols. “The Value of Multiple Approaches: The Early Years of Artificial Heart Research”, Artificial Organs 42, 5 (May 2018): 473-475. “The Promissory Nature of Artificial Hearts”, The Lancet 391,10124 (Mar 10, 2018): 930-931. “Clinical Firsts: Christiaan Barnard and Heart Transplantation,” New England Journal of Medicine 377, 23 (Dec 7, 2017): 2211-3. “Atomic Hearts: A Decade of U.S. Government-Sponsored Development, 1967-1977”, Physics Today 69, 5 (May 2016): 38-44. “Dr William Waugh (1851-1936): Promoter of Change in 19th C Medical Education and Practice”, Canadian Journal of Surgery 59, 2 (April 2016): 143-4. “Repairing Hearts: Innovations in Cardiac Surgery", Heritage Matters 14, 1 (Feb 2016): 13-15. "Negotiating Risk: The Failed Development of Atomic Hearts in America, 1967-1977", Technology and Culture 54,1 (Jan 2013): 1-39. See The Atlantic blog comments by Alexis C. Madrigal.